Since 1989, we have provided our customers with quality products and reliable service. Our Staff is ready to meet your needs! We individually hand make every product. We use American made machinery, American quarried slate, and all other products associated with our production are American made including the boxes. We have always taken great pride in this principal, as well as our quality and uniqueness. People are increasingly seeking out American made products. Signs of All Kinds specializes in custom carved HDU (sign foam) signs, architectural signs, illuminated signs, vehicle graphics and real estate signs. Our banners are made with durable vinyl that can hold its color for years of indoor or outdoor use. 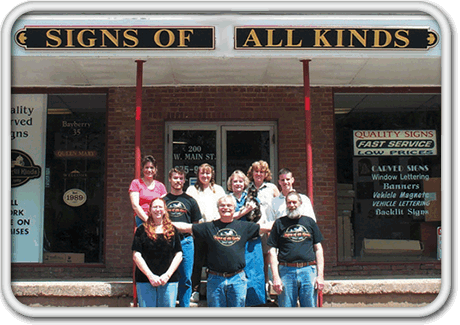 Custom carved signs and architectural signage can be tailor made to a wide variety of shapes, sizes, colors and styles. We also offer genuine hand-applied 23k gold leaf. Illuminated signs and light boxes to increase your company's presence at all hours of the day and night. Unlock your vehicle's advertising potential with vinyl lettering and graphics or full custom car and truck wraps. We also offer real estate signs and job site signage in a multitude of different sizes.